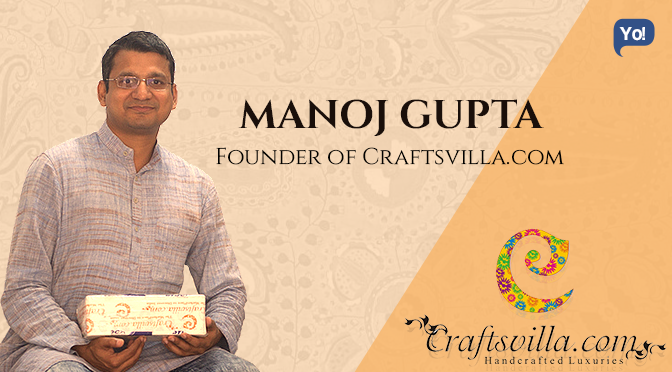 The famous venture capitalist – Manoj Gupta is now also the Founder/CEO of Craftsvilla.com – India’s largest marketplace for Indian handcrafted products. It is a common notion to hear entrepreneurs turning investors, but in very rare cases you will get to see investors turning entrepreneurs. One such case is of our very own Manoj! The E-commerce start-up in the handicrafts space – Craftsvilla, is the life example of an ex-investor i.e. Manoj Gupta, turning into an entrepreneur. Craftsvilla today is known to be one of the fastest growing e-commerce platforms in the handcrafted goods space and is also the only company to have become profitable. Personally speaking; Manoj has a B.Tech from IIT Bombay, MS from University of Illinois at Urbana-Champaign, CPhil from University of California, and MBA from IIM – Ahmedabad. Soon after he completed his Masters from the University of Illinois, he began his career! He started by working for Siliconwave in San Diego as a Design Engineer in June 2000. At Siliconwave his primary tasks included developing bluetooth chipsets and associated firmware and the company being a start-up, Manoj also got the opportunity to learn a lot from them. This stint of his continued for more than a year, after which, he joined the CPhil program at the University of California. During the same time; a professor of his had started a firm called WIT (Wireless Interface Technologies) along with a bunch of PhD’s. He was roped in to be a part of the founding team in July 2001. The company was basically about designing very complex bluetooth and Wi-Fi systems. It later got acquired by Chrontel (a wireless technology company) in March 2003 and for the next three years, Manoj worked with them as their Team Lead. In 2006, Manoj left his job at Chrontel and decided to move back to India, to pursue an MBA degree at IIM (Indian Institute of Management) – Ahmedabad and then joined Nexus Venture Partners – an Indian VC firm with a fund size of over $500 million, as its first non- partner employee. Deccan Healthcare (Board Member), etc. Working for Nexus, was altogether a different experience for him wherein, not only did he help early stage companies and focussed passionate entrepreneurs to build scalable businesses, but he also got to learn a lot from them too. And after 4 years, the day finally came when Manoj left Nexus and to start his own venture! His entrepreneurial journey was rather an unusual one! He always had a dream of creating a big organisation of his own in India and his expertise at Nexus helped him do so. In layman terms; Craftsvilla is nothing but a luxury brand in handcrafted and greencrafted products. 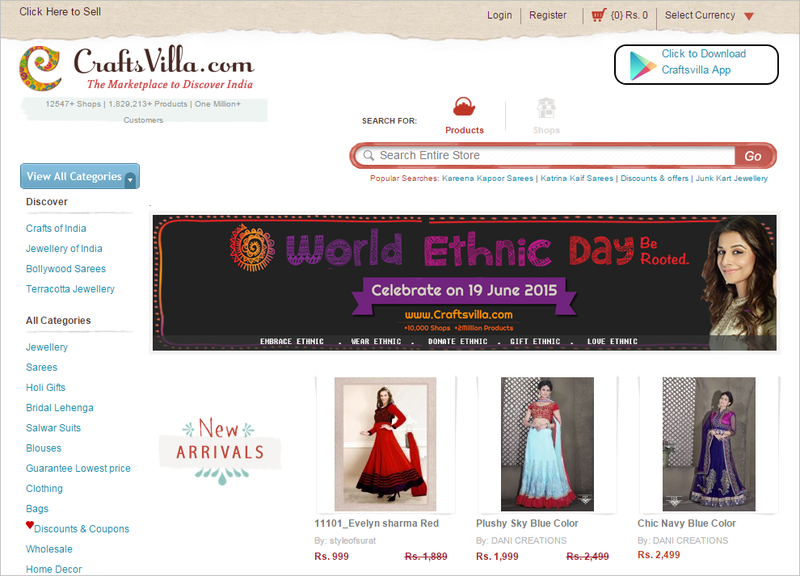 It is an ecommerce portal which sells Craftsvilla branded products and also uses a marketplace model to “Discover Unique Indian Products” including Handmade, Ethnic, Vintage, Organic and Natural products across from India. The portal currently has more than 100,000 products available online. Craftsvilla although is known to be using a marketplace model to capture the regional variations of India but in actuality is far from one. All it does is, it connects local artisans & designers directly to global customers, to increase their livelihood, remove the middlemen, help them create/promote their brand and also preserves our culture / traditions / values. The thought of it had first arrived when Manoj and his wife had gone on a road trip in Kutch and they came across beautiful and bright coloured products which they never knew existed. That is when it first clicked them that, what if a website was created to sell these products. It was originally conceptualized by his wife Monica Gupta. While he was at Nexus, he had mastered the E-commerce space, and on the other hand his wife Monica back then used to work in the handicrafts industry. This got him to thinking that what if both of these skill sets were combined? Goes without saying that, his VC background helped him greatly to understand the size of the market, the market demand, etc. Clearly it was a huge market which still remained untapped. And he very well knew that this venture of his had the potential to go global. Hence he decided to take the leap! The next was he quit Nexus in 2010 and began working on the new found idea! Most of his VC friends were surprised by this unusually bold but risky move of Manoj. Some of them wish that they could do this as well. But they also realise that it’s not an easy journey. If you look at it; while he was with Nexus, he was on the board on of a bunch of companies and leaving Nexus meant giving up all that. As much as the decision was painful but at the end of the day, Manoj knew for a fact that he could always go back to being a VC, if this didn’t work but he wouldn’t always get a chance and courage to create his own big company in India. Anyways talking about his idea; his positioning of the venture was clearly “handcrafted luxury” and unlike his other future competitors in India, theirs was not a marketplace model, mostly because, it’s not only extremely hard to pull off something of that sort in India but, he knew that in the E-commerce sector, there was no room for second or third place; you either lead or you fall out. Keeping all that in mind; finally in December 2010, Craftsvilla was born! The company was initially started by Manoj & Monica, and later their other Co-Founders — Bhavik Jhaveri, Sarvajeet Chandra, Tirath Kamdar had joined in. Now when they entered the $7 billion market of Handicrafts; the beauty of it was that it was one such category that was unique to only India. But then again they being the pioneers of the idea, they didn’t really know about the challenges they might face. So to counter the same they had kept their defensibility and lead time solid. During the course of time, apart from the usual hurdles which every other E-commerce ventures face with their Backend; the sourcing and supply chain system in the handicrafts industry being disintegrated remained a grave issue for them. Additionally, these products were all handmade, and hence maintaining the consistency of their quality was highly important too. Due to this factor, filtering out vendors (artisans) was carried out quite often. Overcoming and fighting all odds, with more than 2500 products on the site (which further increased to 10,000 in a couple of months), more than 100 vendors and over 1000 artisans across India, and lastly, with a margin of 20-25%; they were beginning to rule the untapped market. They also began shipping globally and set up an NGO for the artisans. By end of 2011; 80% of their buyers were women and were also highly attracting the 18-35 age group buyers. Additionally, more than 50% of their orders were coming from Tier 2 cities and 50% of the sales were Cash On Delivery (COD). Now even though the business had begun to come in but, Manoj realised that one the biggest mistakes they were making was that they were building the company for investors, and not themselves. Hence, from there onwards, they diverted their focus on the graphs which showed number growth, instead of the foundation of the company. And since then their numbers spoke for themselves! In a short time; Craftsvilla became the only profitable ecommerce online marketplace in India by 2013. Additionally; they also reported a PAT profitability of 1.2% on their 2nd quarter of 2013 and were now targeting a gross sales of Indian $100 million in the FY14 with PAT profitability of close to 4%. What is even more interesting is that; it has also broken into the top-5 ecommerce companies in India by GMV (Gross Merchandise Value) scale. And when we look at their current stats; in just four years, Craftsvilla.com has not only gone on to become the official leader of their genre but has also listed itself is as the fastest growing and largest online marketplace with close to 2 million unique products from more than 12,000 artisans and designers across the country. Craftsvilla now facilitates over 100,000 transactions in a month, and growing rapidly with organic sources contributing two- thirds of their total traffic. They are now focusing strongly to build a brand, and are also developing their technology to serve our merchants and customers better. Unlike most of the E-commerce players; the marketing spend of Craftsvilla still remains below 10% of their sales, while their revenue has grown by 4 times in last six months. And they are also aspiring to be 10 times our current size by the end of 2015, with 20-Million products on our platform. Talking about funding; Craftsvilla has so far received a total funding of $20.5 Million in 2 Rounds from 3 Investors; with $19 Million being their most recent one in April 2015 from Sequoia Capital, Lightspeed Venture Partners & Nexus Venture Partners, and $1.5 Million being the first one in June 2012. April 2013 – Present (2 years 3 months)Mumbai Area, India Dreamers Early Stage Fund – as the name itself suggests, is an early stage fund for “Technology & Internet Entrepreneurs” who aspire to build a “Billion Dollar Global Company out of India”. The company invests in companies at seed stage and also helps these companies get access to Global Funds and Talent as well. This venture is an initiative of Manoj himself, which started in 2013.